SAN DIEGO -- The Colorado Rockies are starting to get their offense going at the end of a short West Coast swing. "Going in maybe I felt a little timid in the first inning, then I was like, What's wrong with me?" Lucchesi said. "Then I said, Let's get after it.' I was talking to myself, then something fired through (catcher Austin) Hedges. I started catching my rhythm, like all right, let's go. Unfortunately I had some bad breaks with those solo shots that killed me today. I know I went seven innings and at least that's one positive, saved our bullpen a bit. I want to keep going longer in the game. The last two games have been kind of bad realistically, but I'm all right. I'm going to get after it in my next game." 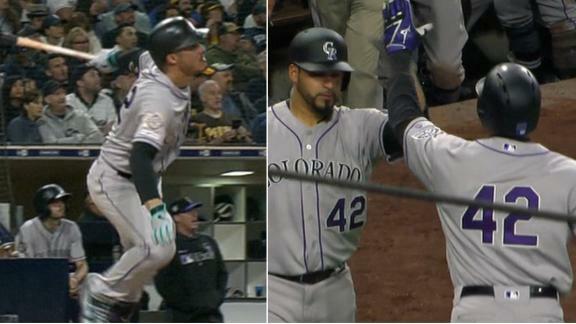 Nolan Arenado and Ian Desmond each hit a home run in the Rockies' 5-2 win over the Padres.